Differential air pressure sensor with a 10 volt or a 4-20mA output for building ventilation applications. Designed for incorporating into a building HVAC management system to monitor and control the distribution of warm or cool air through ventilation ducts. Pressure ranges from 0 to 6 mbar up to 0 to 1000 mbar differential. The DPS 200 ventilation air dp sensor has been designed particularly for measuring draft air pressures in ranges that are typically used in air condition systems for office blocks and factories to monitor airflow. The DPS200 hvac differential pressure sensor is housed inside a ABS plastic box which can be mounted on the wall or inside an instrument cabinet. 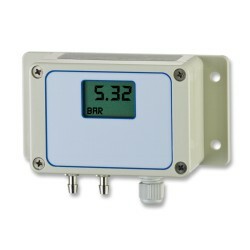 An LCD display can be integrated into the front cover of the sensor housing for local indication of the air pressure. The LCD display can be configured in the factory for reading the pressure in any units such as inches of water, millibar or pascals. The lower portion of the display shows the units the sensor is calibrated to measure and a 52 segment bargraph shows the reading a percentage of the full scale range. Push-on flexible tube fittings and a M12 x 1.5 cable gland are fitted as standard for installing pressure hoses and electrical wiring connections. 2 or 3 wire 4 to 20 milliamp can be specified for industrial process plant control systems or 0 to 10 volt for commercial building utility management systems. Bubbler systems are used to measure the tank contents when the media presents difficulties for other types of measurement technology, such as highly viscous liquids. The DPS 200 is mounted away from the liquid contents, typically at the top of the tank along with a pressurised air supply and regulator to control air flow. The applied air pressure is fed via a tube to the bottom of the tank where it is increased until it equalises with the hydrostatic pressure of the liquid contents in the tank. The regulator controls a steady flow of air through the liquid, hence the term bubbler system. As the liquid contents rise and fall, the bubbler pressure will automatically increase and decrease to maintain the same air flow, in order to compensate for the changes in hydrostatic pressure. The change in bubbler air pressure measured by the DPS 200 will be proportional to the change in liquid level. The liquid level can then be converted into a volume measurement using the dimensions of the tank, and the tank contents determined. What is the power requirement for the 2 wire 4-20mA output version of this sensor, 240Vac, 12 or 24Vdc? The 2 wire 4-20mA loop can be powered by any voltage between 11 and 32 volts dc. We would recommend a 24 Vdc supply, but 12 Vdc will work also if there is minimal additional load of no more than 50 Ohms. On the DPS200 data sheet, it says that the response time can be adjusted from 500 msecs to 2.5 secs, and it also says that the measuring rate is 1 kHz, please could you explain which spec should be used to determine the response of the output signal? The Response time is after the averaging and filtering has been applied. The measuring rate is the speed at which the sensing element is measured by the signal conditioning inside the DPS200 before the averaging and filtering processes. A faster measuring rate allows the collection of more data, which leads to a more accurate output reading after conditioning. Are bi-directional ranges possible with the DPS200 HVAC differential pressure transducer? Yes it is possible to scale the electrical signal output over a combined negative and positive pressure range, e.g. -1000 Pa = 0 volts dc and +1000 Pa = 10 Volts dc. Please select the options you require for the DPS200 HVAC Differential Pressure Transmitter in your application and request a quote. Send us your enquiry for DPS200 HVAC Differential Pressure Transmitter to get assistance with this product type.